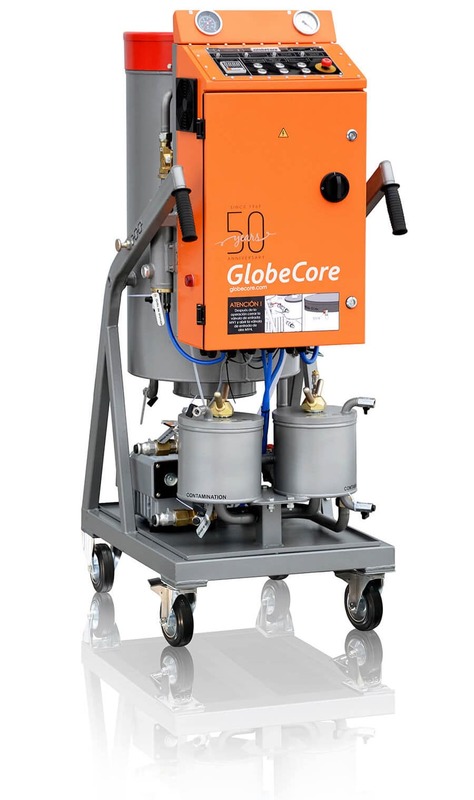 Vacuum Oil filter Machine - GlobeCore. Oil Purification Systems. If lower moisture content is required, or the oil is very dirty and watered– the purity can be achieved by 2-3 passes through the machine The vacuum oil filter machine is installed to small power transformers, that are free breathing type or with a gas relay. A TSS transformer safety system securely connects the machine to an online transformer providing a reliable operation. The oil is drawn from the lowest port of the oil tank and enters the machine, into the first filter housing that retains all the contaminants. The clean oil is heated and enters the vacuum column filled with Raschig rings to create a larger area for oil to spread to achieve space separation of water vapor and gases. A column of Raschig rings extend the travel period of the oil flow in the vacuum system to obtain the best outcome in one pass. The vapor and gas are then removed by the vacuum pump. The cleaned and dry oil passes through a final filtration in a second filter housing before returning to transformer. The CMM vacuum oil filter machines operate in an automatic control mode with a remote monitoring via a smart phone or a PC. 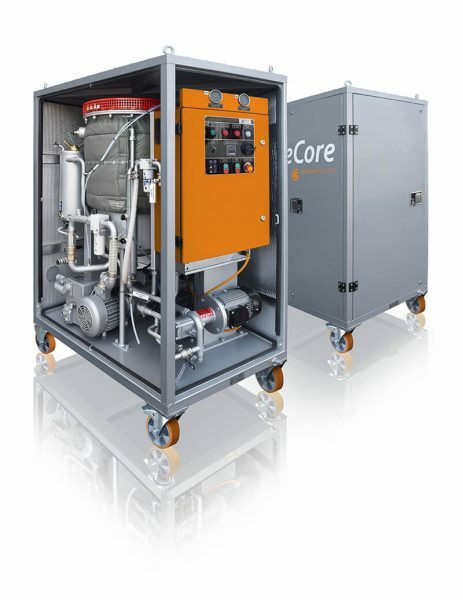 Each GlobeCore vacuum oil filter machine is customized but can also include additional options as inlet and/or outlet moisture meters for the oil flow, an auxiliary vacuum pump, a trailer or a semi-trailer. In the UVM vacuum oil filter machine the industrial oil at an inlet goes through a primary mesh filter that stops the large particles from getting into oil system to protect the fine filter. The oil is fed through the first filter housing then delivered into the heater. The heater supplies an optimal heating avoiding thermally breaking the oil. 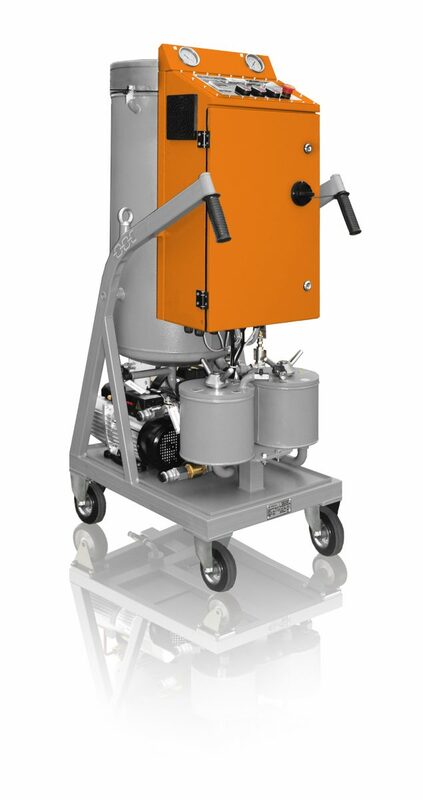 The heated oil enters into the double stage vacuum system including a fore-vacuum pump and high vacuum pump. In a larger vacuum tank with a larger internal area the pump down is substantially slow to drop the pressure to vaporize water vapor. The principle of a fore-vacuum pump is a to build a necessary pressure, low enough to start the high vacuum pump operating, which then has a secondary position supporting the high vacuum pump. Working together two pumps optimize drying and degassing of insulating oil. The gas mixture is extracted and drained from the vacuum chamber. Dry oil follows the extra fine filtration in the second filter and reaches the ideal cleanliness. After being purified all index of the insulation oil including water, gas content and fine particle size corresponding the standard specifications. Heating and filtration mode is first used for cleaning the dirty transformer oil from polluting particles that upgrades the oil quality through a single or multi-stage filtration. It is used in cases when the oil moisture content satisfies the allowable standard levels. As some moisture is allowed in transformers to keep the solid insulation from shrinking through excessive drying. The dirty oil from equipment or container is pulled into the heater, and heated to certain temperature. The heating temperature should not exced 90 C so the oil doesnt decompose. The filter takes out all suspended matter and some water as some of it evaporates in heating. Secondly, heating and filtration is used during filling new oil into a transformer. The vacuum oil filter machine pulls new oil from the drum, passes it through filters, raises its temperature to near transformer temperature and fills the transformer tank. It is a generally followed practice. Thirdly, heated filtered oil is used for hot flushing or hot oil spraying of transformer for drying the water out of solid insulation. As hot oil have high moisture absorbing qualities, leaving the core and windings totally dry. It is easy to perform, although it is very slow. Fourthly, it is also used for heating of medium size transformers as oil goes through a continued circulation in heating and filtration mode. In this case the temperature of circulated oil is maintained at 60-70 C.
A mode of vacuum drying /degassing of transformers is used for on-site drying. The vacuum ensures dryness of transformer core before introducing insulating oil. 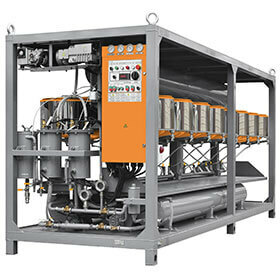 The oil filter machine vacuum system consisting of 2 vacuum pumps: a fore-vacuum pump and high vacuum pump is connected to a transformer to evacuate transformer tank and pump out a vapor discharge. The evacuation process is monitored and controlled to achieve the desired levels. It is a fast and effective transformer drying procedure. The UVM machines are compact and transported on a trailer or semi-trailer to transformers or oil filled electrical equipment for servicing on-site. 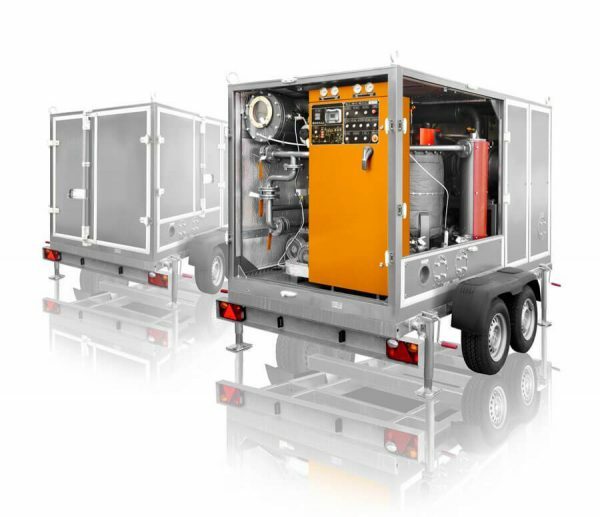 They are used during installation, maintenance and repair works – for filling, flushing, heating oil and transformer, evacuation, extracting solid matter, water and gas from oil. The options include an extra vacuum assembly for transformer vacuuming, oil moisture sensors at the inlet/outlet and remote data monitoring and control. An automatic operation is done through a PC GC provides professional high quality vacuum oil filter machines to service power grid enterprises, transmission and distribution companies in power industry, power substations and utilities. Our mission is to create reliable equipment for the customer.